Faith Danner kept McNary in the game early with her arm. She started the comeback with her bat as the Lady Celts defeated Forest Grove 7-5 on Tuesday, April 3 to open Greater Valley Conference play. Danner needed only 38 pitches to get through the first five innings as McNary went to the sixth with a 4-1 lead. Danner drove in McNary’s first run of the game on a single in the bottom of the second to score Taylor Ebbs. Kate Ronning then scored on an error to give the Lady Celts a 2-0 lead. McNary added two more runs in the fifth inning. After Haley Ebner hit a sacrifice fly to right field to bring home Nadia Witt, Emma Kinler singled to left field to score Alexa Cepeda, who celebrated her birthday after the game. But Forest Grove answered with four runs in the top of the sixth on three singles, a hit by pitch and infield error to take a 5-4 lead. Wanting to set the tone for the inning, Danner led off the bottom of the sixth with a double on a line drive to the center field fence. Haley Bingenheimer followed with an RBI single, driving home pinch runner Abbi Covalt to tie the game at 5-5. After Nadia Witt doubled, Bingenheimer then scored the go-ahead run on a dropped third strike. Ebner then gave McNary an insurance run with a sacrifice fly to right field, scoring Witt from third. Forest Grove singled to lead off the seventh but Danner retired the next three hitters to finish off the Vikings. 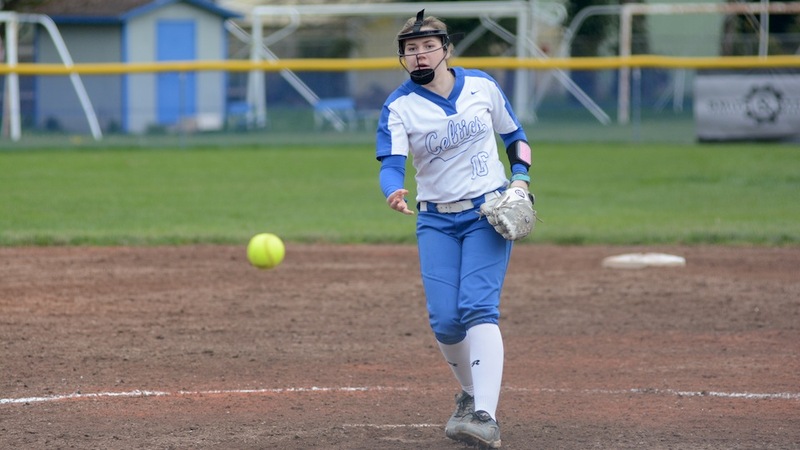 McNary had three freshmen in its infield—Shaylee Custer at second, Ebbs at shortstop and Ronning at third. Bingenheimer, a sophomore who started a shortstop last season as well as games this season, was used as a designated hitter, where she went 2-for-3 with a double, run and RBI. McNary went 2-2 at a spring break tournament at West Linn on March 26-27. After losing to West Linn 8-7 and then Tigard 3-2 on Monday, the Lady Celts bounced back and throttled Lakeridge 20-5 and Grant 17-2 on Tuesday. Ebbs led McNary at the plate in the two wins, going 7-for-8 with six runs, six RBIs, two doubles, a triple and home run. The Lady Celts had 37 hits in the two games, including nine doubles and four triples. Witt was 4-for-6 with four runs, four RBIs, a double and two triples. Ronning went 5-for-7 with four runs, five RBIs, two doubles and a triple. In the circle, Danner earned both wins, allowing five hits and one run while striking out eight batters over seven innings. McNary went back and fourth with West Linn to start the tournament. After allowing two runs in the bottom of the fourth inning, the Lady Celts answered with three in the top of the fifth. When West Linn scored five runs in the bottom of the fifth, McNary came right back with four to tie the game at 7-7. But the Lions scored the winning run in the bottom of the sixth on a ground ball to second base. Witt was 2-for-4 with a home run and three RBIs. Cepeda was 2-for-4 with two runs. Ebner was 1-for-2 with a triple and two RBIs. Bingenheimer was 2-for-2 with a run. McNary left the tying run on second base against Tigard. Down 3-1 with two outs in the bottom of the seventh, Witt singled and then scored on a double to left field by Cepeda. But the game ended on a ground ball to first base. Students at Clear Lake Elementary School are celebrating their uniqueness with an art project that is now on display outside the school. Inspired by the book Only One You by Linda Kranz and a school in Indiana that took on the same task, students in every grade painted rocks to express their unique personalities. Now that they are on display together, the pieces form a rock river in the courtyard of the school. This will be a reminder to students as they go through their elementary years, and on, that they are special and have the power to make this world a better place, simply by being them, said Julia Ortman, school counselor. Windsor Rock donated rocks for the project, Egan Gardens provided bark dust for the display, McNary High School World of Work Students, led by teacher Kevin Wise, weeded and cleaned the courtyard area, Happy Hearted Designs provided a sign and the Clear Lake Parent-Teacher Association provided funds for items like paint and brushes. “I believe Clear Lake Elementary and the city of Keizer is a great place to be, because of things like this. When an entire community can come together for an art project like this, you know that each individual is helping make the world a better place for all students,” Ortman said.